The GripGo is an adjustable phone mount that you can stick onto your windshield. The mount attaches with a suction cup and you simply attach your phone to the other end of the mount. The adhesive is super strong and holds your phone tightly. Then you can adjust the arm of the mount for best visibility: You can even pivot your phone so that you can read maps better! All the while your hands are on the wheel and your eyes on the road. You don’t risk losing your cell phone to slips and slides, either: It stays put. Securely holds your cell phone so that it doesn’t become damaged. Keeps your hands free while driving. Using Grip Go allows you to keep your eyes on the road while taking calls or checking out maps. 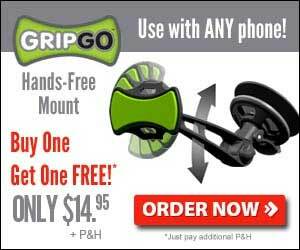 The GripGo suction cup won’t damage your windshield and the mount won’t leave any residue on your cell phone. GripGo is adjustable so different drivers of the same vehicle can adjust the mount according to their own height and comfort.